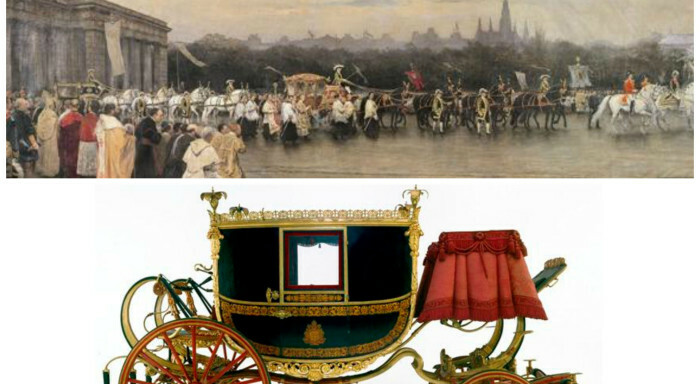 In the past, the magnificent Berlina di Gran Gala, constructed in Rome in 1826 by Leone XII, stood as the focal point of the Pavilion of the Carriages alongside the new ceremonial carriages that belonged to the Popes, or the Princes, of the Holy Roman Church. Later, some large paintings were added to the collection; these depict the papacy’s mobility throughout history as the Church’s seat of power moved to a number of different locations. A series of splendid marble and bronze busts depicting the pontiffs from Pius VI through Saint John Paul II were also installed, corresponding with the vehicles on display. The Pavilion of the Carriages collection also contains sedan chairs and the splendid court vestments of lay dignitaries who accompanied the Popes during their voyages. Until recently, only the Graham Paige 837 from 1929, the Citroën Lictoria C6 from 1930, the Mercedes 460 Nürburg limousine designed by Ferdinand Porsche, one Mercedes 300 Sel, and three Popemobiles (Land Rover, Toyota and Mercedes 230 GE) belonged to the popemobile section. In the last two years, the Fiat Campagnola linked to the 1981 assassination attempt of Pope John Paul II in the Piazza San Pietro, the last Maggiolino produced by Volkswagen in Mexico in 2003, and a Renault 4 given to Papa Francesco in 2012 were added to the small automobile fleet of the Vatican Museums.